HP Laserjet P3015 tray 3 roller kit. 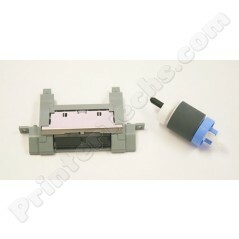 Contains the pickup roller and separation pad for tray 3 in the HP Laserjet P3015 series printer. HP Laserjet P3015 tray 3 roller kit containing the pickup roller and separation pad for tray 3 - the same parts as in tray 2. The maintenance kit for the HP P3015 only contains parts for trays 1 (manual feed tray) and tray 2 (500-sheet tray). Order this if you have the extra paper feeder (tray 3). HP LaserJet Enterprise P3015, HP LaserJet Enterprise P3015d, HP LaserJet Enterprise P3015dn, HP LaserJet Enterprise P3015x, HP LaserJet P3015n.